The Project Management Certificate program is looking for partners who are interested in supporting student learning while fulfilling their business needs. In the last class of the certificate program, the Project Management Practicum, students are assigned to work with a local organization to put their skills to use in a real-world setting. The partnership offers great value to the business while supporting the students’ goals of becoming project management professionals. What does the Project Management Practicum consist of? The Practicum is the final course of the PM Certificate program, and provides students the opportunity to apply everything they have learned on a real project. 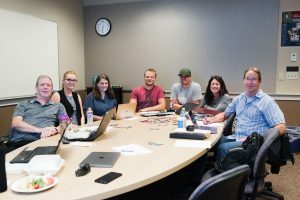 A team of 7-10 students are assigned one real project from a real customer and are expected to envision a solution, plan the approach, assign work to the team members, and execute their vision in 10 weeks. Their final class is a presentation of the proposed solution to the customer. What types of companies is the program looking to partner with? Typically, the customers are local non-profits. We’ve worked with Girl Scouts, Boys & Girls Clubs, Hopelink, Wildlife shelters, Eastside Baby Corner, a service-dog placement group, mountain-bike organizations, etc. We have also partnered with a local city department (Tukwila Department of Emergency Preparedness). What is the criteria for consideration? Be sized to deliver in 10 weeks. Non-critical to the company (we have no way to know what skills the students will bring to the project. Have a point of contact within the company/non-profit who can articulate the need and answer questions throughout the 10 weeks. I would usually meet with the company representative to discuss project ideas and ensure we agree on a scope that can be accomplished within our timeline. What is involved in the commitment? The company representative should be willing to attend at least the first and last night of the class. During the first night they explain the project needs/goals and answer questions. This might last 30-60 minutes. The last night is the team presentation and generally lasts 30-45 minutes. In between, the team will send a weekly status reports including questions for additional information. Occasionally, the team might request an on-site visit or a meeting with other staff members. Are there internship/hiring opportunities after completion? Many of the students are looking for new opportunities or employment and may be open to that. How will the participating business benefit? Non-profits have limited resources and budget, and generally cannot afford to spend on marketing plans, training plans, retail plans, etc. (the types of requests we normally see). The work performed by our team is free to them and generally amounts to 700-1000 hours of volunteer labor. Even if the organization does not implement the solution, they benefit from seeing fresh ideas and different points of view. I don’t try to steer the team towards a particular idea/solution, even if I have thoughts on how it could be solved. I prefer to let the team generate ideas that they feel confident in delivering. I’m constantly impressed by what they come up with even if they had no prior experience in the particular problem space (i.e., no prior retail planning experience). They commit to a vision, and research the topic at hand, and build upon their individual strengths. A great win-win for the non-profits and the students.